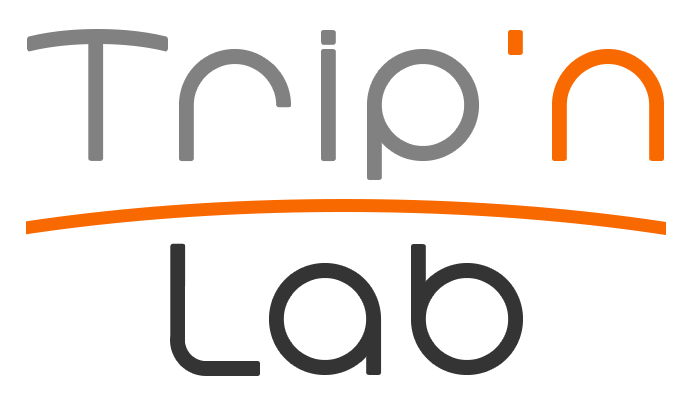 Conventionally, it is desired to have each physical input on your AVB device routed to its own independent “To Computer” audio stream. Using the techniques discussed above, fold the “To Computer” output bank, and the input banks for the physical inputs you are recording in the Routing Tab. Glide horizontally across the input banks you plan to record, along the To Computer row, to make the appropriate connections. If you enabled enough To Computer streams in the Device tab to cover all of your physical inputs, you can make connections with one gesture. (If you didn’t enable enough, you may be left with a Green tile at the end of your row, denoting the last bank lacks a complete set of connections). 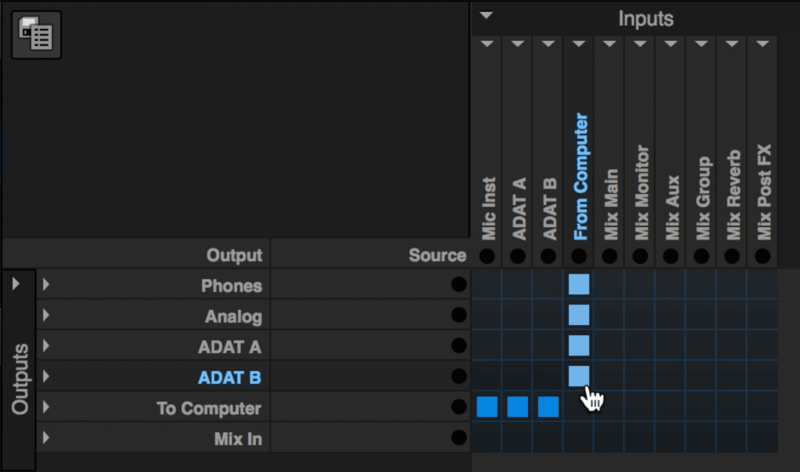 Repeat the same process to route the “From Computer” input streams to your unit’s physical outputs, or any other set of output channels you want your DAW’s playback to be sent. For example, in the Routing Tab, fold both the From Computer input column, and the output rows for your unit’s physical outputs, and glide from top to bottom. Doing this, each From Computer output stream is routed to its own physical output on your unit. You also have the option to feed your DAW’s output to your AVB audio streams or your unit’s on-board mixer and utilize your unit’s signal processing tools. 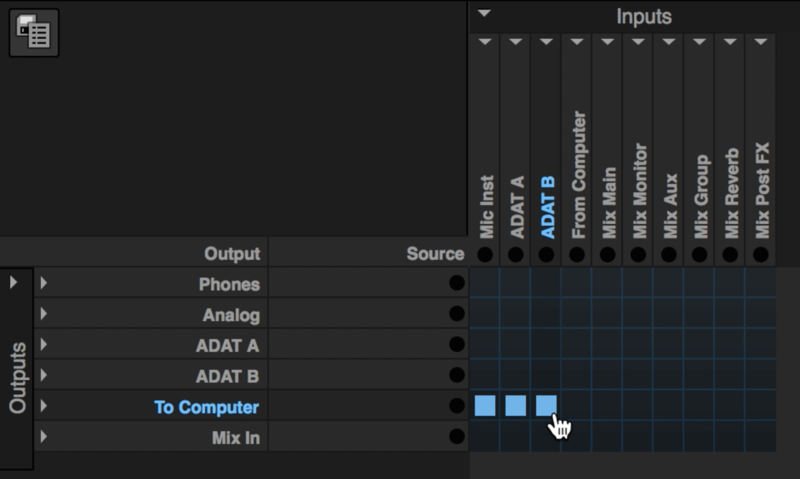 To do so, make a connection to route the From Computer stream to a “Mix In” output, or AVB output stream. 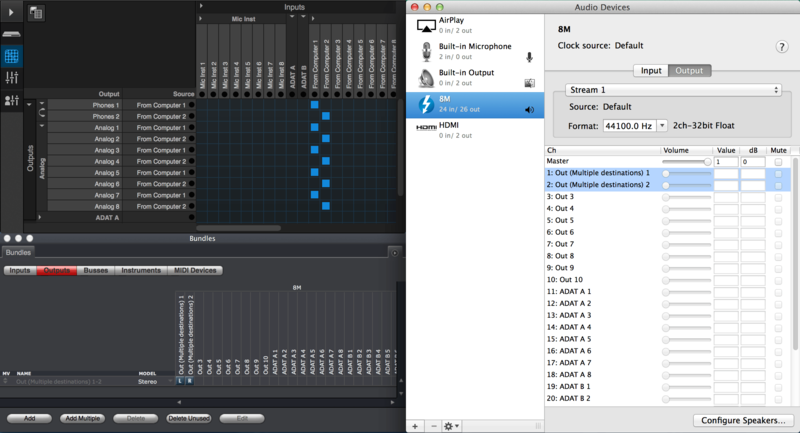 If your AVB device is connected to Mac OSX via Thunderbolt, you can see your unit’s channel names in the Audio Devices window of the Audio MIDI Setup. When no connections are made for the To or From Computer audio streams, the input and output channel names will be listed by their default names, (In 1, In 2, Out 1, Out 2, etc.). When a connection for these channels are made in the Routing Tab, the Input and Output channel name will update in the Audio Devices window. Here is how your Inputs and Outputs tabs will look in the Audio Devices window after routing the To and From Computer streams. Digital Performer will also show these updated channel names automatically when To/From Computer connections are made or removed. 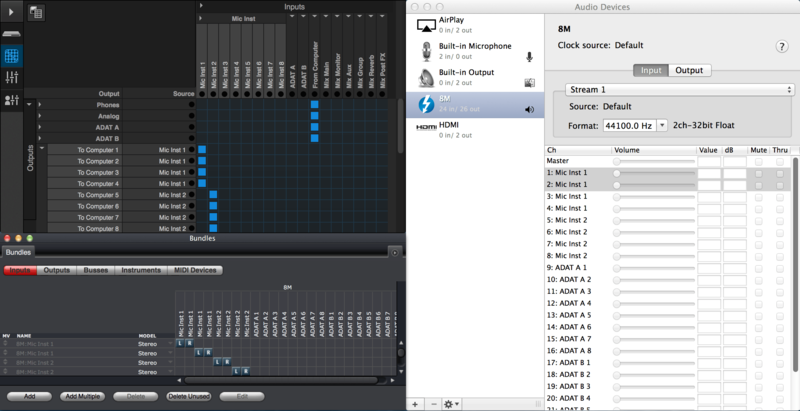 For example, when viewing the Bundles window in DP8, the column headers for the Inputs and Outputs pane will reflect the channels that are connected to the To / From Computer audio streams in the Routing Tab of the AVB Discovery web app. If your DAW does not utilize CoreAudio dynamic naming, the channel names will not update within the application when making these connections, like they do in Digital Performer. The default To/From Computer audio stream names will remain, Audio In 1, or Audio Out 1, etc. In this case, it may be best to keep the Audio Devices window of the Audio MIDI Setup open for reference. Note: When your device is connected to your computer via USB, the names of the To/From Computer audio streams will not update when these connections are made. In this case, channels will always be displayed as Audio In 1, or Audio Out 1, etc. It is possible to route the same physical input to several To Computer audio streams. In doing this, the physical input name would appear multiple times for each To Computer audio stream, as shown in the Bundles window of DP. Doing this, these To Computer audio streams would be carrying the same input signal, which could be recorded simultaneously on multiple tracks in DP. Conversely, the same From Computer audio stream can be routed to multiple destinations simultaneously in the Routing tab. This is helpful in situations where you want an output bundle available for your audio tracks in DP, all of which will send the same signal to multiple outputs on your device. When assigning the From Computer 1-2 input channel to Phones 1-2, Analog Out 1-2, and Analog Out 3-4 output channels in the Routing tab, these audio streams would be renamed to “Out (Multiple Destinations) 1-2” (as shown in the Audio Devices window of the Audio MIDI Setup, or the Bundles window of DP8) and will feed the same signal to all three physical outputs pairs at once.